sorry to tell you glober, but there isn't a choice of alphabets to vote for in this site - when a new alphabet is started the only way to get any other would be to purchase it, but there are times when alphabets are offered at a reduced price, so stay vigilant. (and the next alphabet may well be one that you will love). Seria algo muy bello de poner este alfabeto para votar. El diseno de Angel es muy sagrado, tambien muestra inocencia, y belleza. ninos y ninas tienen nombre cada letra puede representar un bebe. Por favor ponga este diseno para votar, es un diseno muy bello. Este alfabeto es muy especial, y tiene pureza. Por favor vote por esta belleza. 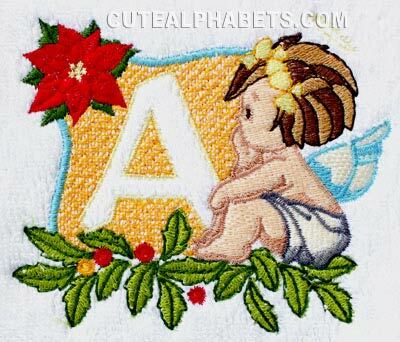 Please vote for this beautiful angel alphabet. This font is absolutely as cute as it can be and very pretty. This is a beautiful font, Veronika. Your ideas and skill never cease to fascinate and amaze me.